Each year, I lead a uniquely specialized tour to Russia. The tour includes my native city of St. Petersburg, Moscow, and an ancient city of Novgorod. 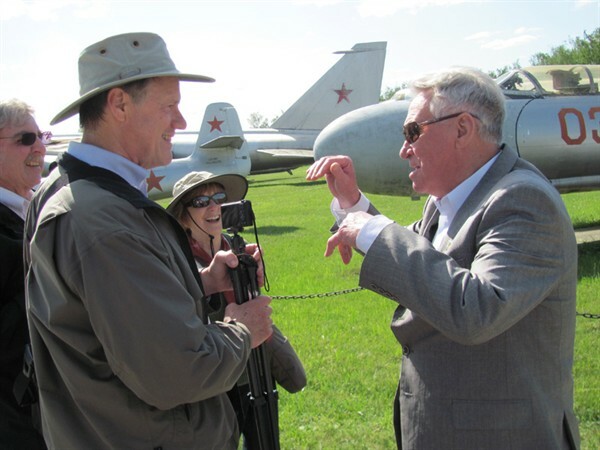 I have more than 20 years of experience leading tours in Russia, Western Europe, and the US. I accompany the tour group during all elements of the tour. My tours always feature small groups of from 2 to 6 participants who work with me to determine the details of the itinerary.The basic format of the tour includes includes round-trip air travel [Boston-St. Petersburg and Moscow-Boston]; a transportation to Novgorod from St. Petersburg, overnight train transportation to Moscow; airport transfers in St. Petersburg and Moscow; lodging at comfortable, centrally located hotels in St. Petersburg, Novgorod and Moscow (with breakfasts); guided visits to all the major attractions; and a river cruise. Also included are a series of personal visits with Russians representing areas of Russian society of particular interest to the tour group. Artists, educators, students, political figures, entrepreneurs and journalists are among the individuals who can be scheduled for interviews. Single occupancy accommodations and tickets for theater and ballet performances are available for an extra charge. During the trip into St. Petersburg from the airport, the driver, Alexander Levitskiy, talked to the group about his family business in which he and his father manage a fleet of 8 Mercedes vans. The group met with award-winning artist, Luba Vecheslavova, for a Russian tea party at her studio in downtown St. Petersburg. After breakfast, the group traveled to Peterhoff, for a tour of the summer residence of the tsars. During the 90-minute drive, the guide, Lena Levchenko, and the driver (Alexander) spoke with the group about real estate issues in Russia such as the buying and selling of apartments and the different types of summer homes (dachas) which could be observed from the van along the way. During the drive, there was a brief stop at the Konstantinovsky Palace where President Medvedev and Prime Minister Putin reside and hold meetings with foreign dignitaries when they are in St. Petersburg. The return trip to the City was by hydrofoil on the Gulf of Finland and the Neva River, enabling the group to see the homes of wealthy Russians from the water. The conversation involved the 900-day siege of Leningrad during World War II, the loss of more than 20 million Russians at the hands of Nazi invaders, and the devastation and rebuilding of Russian cities and town. During lunch at the Hermitage Museum restaurant, there was a discussion of the present and future availability of the Hermitage Museum as the home of the world's largest collection of great art. It was pointed out by the tour director that during Soviet times the Museum was open almost 24/7 and was available to everyone at almost no cost, while currently the Museum is open only 6 days a week during specified hours, some major pieces are leased to other museums around the world, and access is sometimes limited because of VIP tours and corporate events. The conversation focused on how the Museum's operation has changed and how it is now being run as a business enterprise. There was a guided walk along the embankment of the Neva River, where the group could see how 18th century mansions of the Russian nobility had been converted into libraries, museums, and a university. The walk ended at the Nikolaevsky Palace, where the group saw the famous Russian folk show, “Feel Yourself Russian,” featuring traditional Russian music, costumes and dance. During the intermission, there was a vodka and caviar reception where the group had an opportunity to meet with artists and actors in period costumes. The return to the hotel was by trolley so that the group could get a sense of Russian public transportation. After breakfast, the group traveled to the City of Pushkin, for a tour of this tsarist residence famous for its “Amber Room.” During the 1-hour drive, there was a discussion of Russian wages, opportunities for advanced education, the job market, and everyday life in St. Petersburg. Lunch was at a typical Russian coffee shop with traditional Russian food. There ensued a conversation about Russian cuisine. After lunch, there was visit to the restored church, Christ the Savior on the Blood. There was a discussion of the history of the site of the church and the life of Tsar Alexander II, who was assassinated at that spot in 1882. There was 2-hour stop at an open market to do some souvenir shopping. The tour director explained different kinds of Russian folk art and their importance in Russian culture. The group then visited the Gallery/Museum at the Academy of Fine Arts where they met with the Director to discuss current trends in Russian art and opportunities for young Russian artists. The group was able to meet with 5 students at the Academy who were working on their final projects. The students were eager to discuss their work and explain its significance with the tour group. After dinner, the group attended a concert at the Smolniy Cathedral, presented by graduates of the St. Petersburg Conservatory of Music. After breakfast, there was a visit to the Alexander Nevsky Lavra of the Holy Trinity, founded by Peter the Great in 1710. In 1900 the monastery complex included 16 churches of which 5 remain today. The group attended services at the Trinity Church and then sampled freshly baked bread made by the monks at the monastery as the tour director discussed the lives of the famous Russian dignitaries buried at the Lavra: Dostoyevsky, Mussorgsky, Tchaikovsky, Borodin, etc. 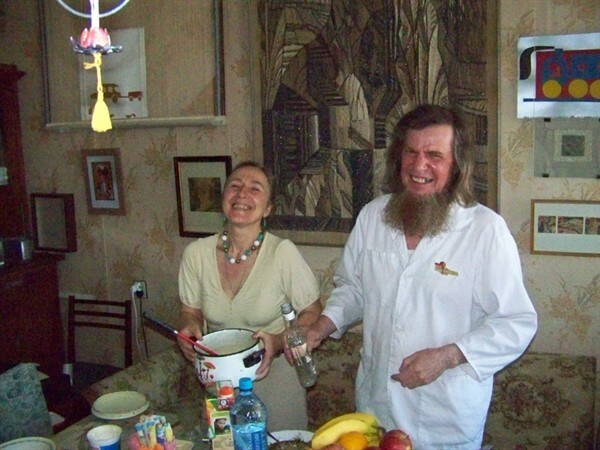 The group then paid a visit to the apartment of Russian artists Vladislav and Galina Bushuyev, who treated them to a 4-course Russian meal and engaged in a lively conversation on Russian politics, society and opportunities in the “new Russia.” Vladislav is one of the leading portrait painters in St. Petersburg and has been commissioned to do portraits of almost every famous poet, composer, writer, architect, singer or actor in St. Petersburg. Galina does tapestries and runs an art studio for young children. They were very open to discussing their work and the role of the artist in contemporary Russia. Back at the hotel, the group met with Tatiana Galaktionova, a new Russian entrepreneur who received a special award from the Russian Department of Agriculture for her innovative work in developing the in-vitro propagation of blueberry bushes in Russia. The discussion focused on the challenges facing women in the Russian business world, her ability to open three new flower stores during the current financial crisis, and the expansion of her blueberry initiative. After dinner at the Strogonoff Palace and a discussion of the importance of the theater in Russian life, the group attended a unique and innovative performance of the Nutcracker ballet at the world-famous Mariinsky Opera and Ballet Theater. After breakfast, the tour director led the group to visit an up-scale Russian grocery store and the biggest department store in St. Petersburg. The discussion focused on comparing choices and prices in these stores to those in American stores. After the cruise, the group was invited for lunch at the restaurant Sudar by Irina Novikova, the owner of the Sudar and several other restaurants in St. Petersburg. The 3-hour discussion centered on the concerns and obligations of a restaurant owner in Russia, including taxes, property rental, medical insurance, coping with the financial crisis, marketing, employee benefits, keeping quality employees, tipping, the cost of living, etc. In the evening, the group made a 3-hour trip by van to the ancient city of Novgorod. The driver, Yevgueniy, was very proud of the fact that he owned his own luxury van and was part of the newly emerging Russian middle class. The conversation involved gas prices, taxes, elections, family life, promoting his business, etc. As with most Russians, Yevgueniy felt that life was getting better in Russia and that future generations will have even more opportunities. After an early breakfast, the President of the Novgorod Agricultural College, Dr. Sergei Borisovich Pavlov, met the group at the hotel and drove them to his colleague's summer house on the lake. During the 40-minute drive, the group passed several farms. Dr. Pavlov spoke about the state of farming during Soviet times and during the present time, government subsidies to milk producers, and the cost to produce a liter of milk vs. the price in the store. Also during the drive, the group met with the Director of a milk farm cooperative. He talked to the group about the operation of his farm. At the summer house, there was a discussion of everyday life in Russia, and the group had the opportunity to see a “thermal house” or Russian sauna, typical in Russian summer houses. 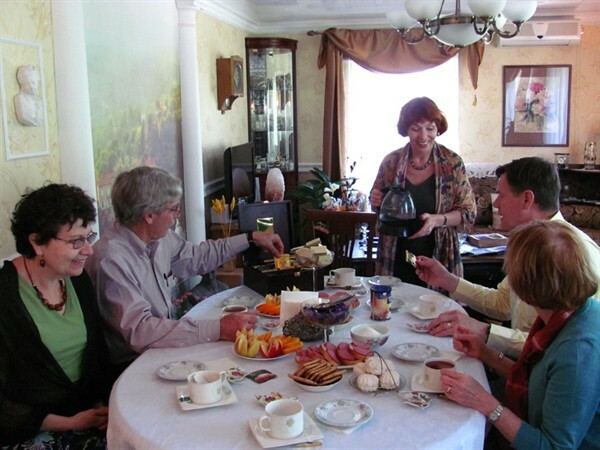 There followed a tea party with tea from a traditional Russian samovar. Then the group was taken to the College and met with about 100 students and faculty. There were beautifully prepared “power point” presentations by students designed to illustrate the programs and offerings for students and the job opportunities for graduates. During the Q&A session, the group and the students exchanged ideas on a wide range of topics. There was a tour of the College, including a stop at the Museum of Remembrance, where there was a discussion of how students from the college do some excavation projects related to the massive destruction of the area during the Nazi invasion in World War II. This work maintains students' awareness of the devastation and terrible loss of life in this area during the war. The visit to the College ended with a 4-course meal with administrators, during which there was a discussion of advanced education in Russian, the effect of the collapse of the Soviet Union on Russian education, the effect of the decline in population on recruitment, competition for students, etc. After returning to the hotel, there was a tour of the Novgorod Kremlin with the Curator of the Museum, Tanya Kuzmina, an expert in Russian history. During dinner, the group had the opportunity to speak with a server who said that she had a master's degree in Early Childhood Education. After working for ten years in a school, she realized that she could make more money working as a waitress at an upscale restaurant and apply her knowledge of child psychology to working with customers. After breakfast, the group visited the The “open air” Museum of Wooden Architecture which features a number of buildings from of the 12th to the 19th enturies. The tour allowed the group to understand what life was like in that remote era. Later, Tanya Kusmina led the group on a walking tour of the City, including visits to a number of churches and monasteries dating back nine centuries. The group then stopped for a tea party at the home of Russian artist,Vera Ahmedova. 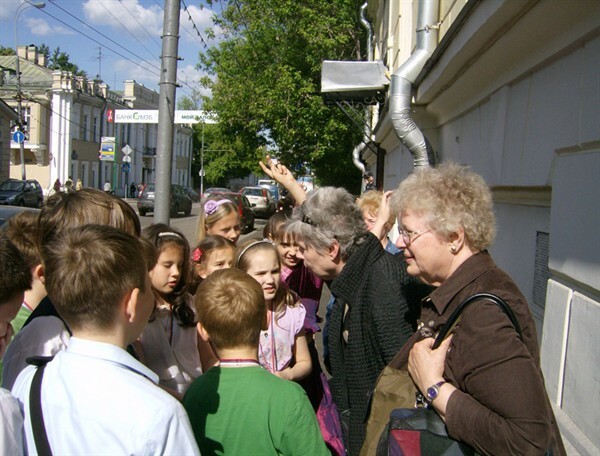 Vera talked about her art, her beautiful garden, the experience of her family in Stalinist “gulags,” and her own life story which led from Engineering School to a job as and English teacher to a career as an artist. There was then a visit to the Novgorod University to meet with 12 students enrolled in an English language enrichment program. The visit included a discussion of the reasons for their taking the English classes and focused on the importance of English for career advancement. After the meeting, the group took an overnight train to Moscow. After settling in the hotel, the group was taken on a 3-hour city tour of Moscow by tour guide, Yulia Nikiporets. The tour included a discussion of issues related to life in Moscow such as it's status as the world's most expensive city. The group met for lunch at an upscale art gallery with 27 year old Moscow entrepreneur, Yulia Sannikova. The discussion focused on the lifestyle and values of the new generation of highly successful “self-made” young Russians living in Moscow. In the evening, the group visited the “Arbat,” a pedestrian street that features artists, musicians, cafes and vendors. There was a discussion with a very creative entrepreneurial street musician who makes his own instruments, performs, and markets his own music. After breakfast, art historian and Kremlin expert, Irina Antonova, led the group on a tour of the Moscow Kremlin and Armory where the Romanov treasures are on display. After a lunch on Red Square and a discussion of the highlights of the tour there was a “subway tour” to experience the magnificent Moscow subway system and to discuss the policies of Stalin and Khruschev on subway development. After breakfast, the group visited a major Moscow exhibition including multiple commercial pavilions dedicated to economic achievements of successful Russian companies.